More than 97% of Internet e-mail is unwanted, according to a Microsoft security report. As an email administrator, you have to deal with thousands or millions of spam messages. Unwanted messages overflow mailboxes with spam, viruses and phishing attacks. These high risk emails generate user complaints, virus outbreaks and consume both server and human resources. Is Your Current Spam Solution Effective? The battle against spam has been raging for years, an unprotected email system must accept a message if it holds the destination mailbox. Without a security layer protecting your server you are instantly a victim of spammers or viruses. Traditional methods of stopping spam, such as keyword filters and Bayesian Analysis are becoming increasingly less effective as spammers develop techniques and knowhow to bypass these technologies. Spam prevention systems currently available are expensive, difficult to implement and costly to maintain. Smaller organizations, schools, churches, police, government offices and personal domain owners do not have unlimited resources to fight spam. 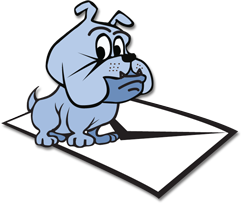 Outsourcing email protection to MX Guarddog relieves you from the duties and problems associated with spam. We will correctly identify all incoming spam for your domain, placing spam in quarantine on our servers, forwarding only clean messages to your user inbox. Spend more of your time watching the game on TV, or quality time with loved ones rather than battling inappropriate emails from reaching the inbox. Even with no configuration, MX Guarddog is highly effective and needs no care and maintenance. For administrators who need more control you can increase or decrease your level of protection. I used to spend twenty minutes a day looking through spam. After switching to MX Guarddog my mailbox is clean, your system really works well, I could not be happier. Old-fashioned keyword filters are no longer efficient against stopping spam; MX Guarddog uses collective intelligence technology to protect your mailboxes. Our servers use the collective intelligence of all mailboxes to fight spam. Based on our unique intelligence systems, we maintain our own real-time blacklist, which can identify and stop spam much faster than traditional filtering methods. Our systems learn automatically based on input from all mailboxes, stopping spam with the highest level of accuracy and does not require continuous updating by administrators. The majority of spam stopped at our servers is done with our collective intelligence technology; the old techniques are just not as effective. If you are currently using, or considering a spam solution that resides directly on your servers you cannot benefit from the collective intelligence technology in use by MX Guarddog. The volume of email processed is our secret weapon again spam. Getting setup with MX Guarddog is easy, the process is automated with no requirement to speak to an agent or waiting for account approval. Our prices are clearly defined, no need to negotiate pricing and you will receive no annoying sales calls. Register on-line and you can be up in running in just minutes. Your first month if free, regardless of how many email addresses you have. Future months you pay only for what you use, based on how many email addresses you have at your domain.